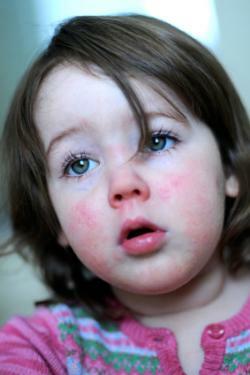 The red strep rash of scarlet fever is the hallmark sign of the disease. Scarlet fever occurs in a small percentage of children, most commonly between the ages of 5 and 12, who get a strep throat infection (streptococcal pharyngitis), and less often, a strep skin infection. Because scarlet fever is usually associated with a strep throat, this scarlet strep rash is typically accompanied by the symptoms and signs of strep throat. The distinctive strep rash of scarlet fever is caused by a toxin produced by the strep bacteria that affects the skin. Some people refer to the condition as strep rash, while others call it scarlet fever rash. The face is red with often a pale ring around the mouth. After the strep rash resolves, the skin can peel, especially on the tips of fingers and toes, the palms, and the groin. Scarlet fever and strep throat are caused by a bacteria called group A beta-hemolytic streptococcus (Group A beta strep). 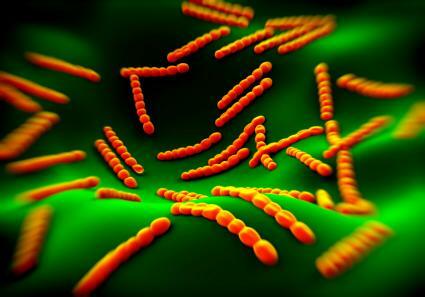 Scarlet fever can occur 1 to 7 days after exposure to the bacteria, with an average of 3 days. Can be spread from infected airborne droplets from the mouth or nose through coughing or sneezing. If sore throat is accompanied by coughing, sneezing, or a runny, stuffy nose usually the cause is a virus and not group A beta-strep. The doctor usually starts with the rapid test and if it is positive he can prescribe treatment then. Scarlet fever and Strep throat are curable with oral antibiotics, usually a penicillin such as Amoxicillin. Antibiotics shorten the time a child is contagious and most patients will not be contagious after 24 hours of antibiotics. Anyone less than 20 years old should not be given aspirin because of the risk of Reyes' syndrome, a potentially fatal liver and brain disease. Scarlet fever with its accompanying distinctive scarlet strep rash is highly curable with early treatment. If your child develops a rash with sore throat and a high fever, be certain to see a doctor for treatment with antibiotics to prevent serious complications.